Emily started gymnastics at the age of 5 and has been coached by her current personal coach, Sara-Jane Inglis since the age of 7. She currently trains around 25 hours a week in the Elite Competition Squad. Emily has amazing natural talent and a "gymnastics brain" - she is able to learn very difficult skills quickly and easily. She has extremely powerful legs which helps to make her a strong vaulter and tumbler, she is also very steady on the beam and is continually working hard to make improvements on her most challenging piece of aparatus, the bars. Emily is TNAG's first gymnast to be included in the Great Britain Squad, having earned a place in the World Class Start Squad for 2009-2010 and 2010-2011 and the World Class Potential Squad for 2011-2012. She is also the first gymnast from the Academy to be selected to represent Great Britain, a feat which she achieved twice in 2011 - once against Sweden at Lilleshall and once travelling as part of the GB team to a five way youth international in Germany. With further interational opportunties surely awaiting her in 2012 and beyond, Emily can justifiably claim to be one of the top junior gymnasts in the country, and the very best to come out of Norfolk for many years. Emily receives financial support from Broadland District Council and The Joanna Scott Foundation. Junior British Schools individual champion, and silver medalist with team. 11th place at British Espoir championships, 2nd placed qualifier to floor finals where she finished 4th. 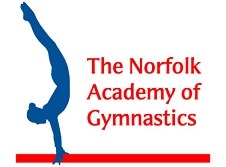 Member of Norfolk Academy FIG team that took bronze at regional FIG championships, and individual silver medalist at espoir level, regional champion on vault and silver medalist on bars, beam and floor. 5th place overall at English Junior Championships Part of East region team for British Schools championships. Wins bronze medal with team and joint bronze individually. Melissa moved to the Academy in spring 2008 and has made massive improvements since she did so. Melissa is a very bouncy gymnast which means she is a strong tumbler and a delightful performer on the floor. Melissa has a strong relationship with her personal coach Jan Barrett and has already achieved an impressive haul of honours at both county and regional level which she hopes to add to in the future. Norfolk champion at level 3 age 11/12 years, 7th place at regional final and silver on bars. Olivia transferred from a recreational club to TNAG in spring 2008 and immediately made a strong impact. With excellent natural strength and ability Olivia quickly became one of the leaders of the group and has enjoyed success already in both grades and voluntary competitions. As one of the jokers of the group, the gym is never dull when Olivia is training! Laura moved to the Norfolk Academy in spring 2010. She has very good levels of natural ability across the pieces of aparatus. After a transition period, Laura has now settled into the demands of high level gymnastics and has made very good progress. Laura is an excellent competitor and has a very good gymnastics brain, meaning she is able to learn new skills easily, and she shows little sign of nerves, either in training or competition. There are high hopes for Laura to qualify for the British Championships via the Challenge Cup. 10th place at Miss Alpha Factor at compulsory 3 4th place at regional championships at compulsory 3 Member of the East region team for the national finals at compulsory 3. Won silver medal with the team and placed 24th overall Norfolk silver medalist at in age level 3 12th place overall at in age level 3 at Alpha Factor Open Fourth place at in age level 3 at regional championships, bronze medalist on beam Part of silver medal winning team at level 3 competition at the Sapphire Invitational 26th place at national finals for in age level 3. Combined level 3 ranking of 20th for the year. Fourth place at Miss Alpha Factor at grade 7 Regional champion at national grade 7 Part of East region junior team for British Championships, took silver medal with team and placed 12th overall. Grace joined TNAG in late 2008 and was very quickly promoted from a recreational class into the development squad for her year group. She has been coached by Helen Inglis in ECS2 since 2009. Grace has beautiful poise and artistry and is stunning to watch on beam and floor. She also has a very good attitude in training and a good work ethic. Mim also joined the recreational set up at TNAG from its opening in early 2008 and also took part in the inuagural Talents Selection Day and was a founder member of EDS02. From there, she showed a good aptitude to hard work and became one of the leading lights of the squad, progressing into ECS2 under Helen Inglis in 2009. Mim has had some very bad luck with illness and injury in the last couple of years, having to miss some important competitions or having limited preparation time, but Mim has remained committed and dedicated despite these set backs. Mim undoubtedly has the talent to reach a very high level in the sport. Erin has a tiny petite frame which is absolutely suited to gymnastics and her aptitude for the sport has been evident since joining the recreational classes in 2008. Erin was part of the 2003 born development squad and now works in ECS2 where she is coached by Helen Inglis. Erin has made excellent progress and has a complete and total love for the sport. Erin has been in part hampered by her size to date, as she understandably struggles a little with the power events, but her good technique will win out in teh long term where her talent and technique will surely shine through in the long term.